There are two key types of sitemap for a website. Take a look at the information below to see which you would like to include on your site. XML Sitemap: XML sitemaps are not visible on your site. InstantPro automatically updates an XML sitemap in the background as you update pages & make changes to your content. If you submit your XML sitemap to search engines, this helps search engine crawlers to identify all pages on your site. If you are looking to submit an XML sitemap for search engine use, follow the below tutorial. Sitemap for visitors: This is a page that lists all of the pages of your site and links to them for navigation. These sitemaps can have a positive influence on search engine rankings. If you want to include a sitemap for your visitors, take a look at our Creating a Sitemap for Visitors Tutorial. The sitemap that the builder creates is not intended for use by visitors to your site. It is designed as an easy way for you to submit your sitemap to Google using their Webmaster Tools; which will make it easier for search engines to find your pages. Google Webmaster Tools provides you with some powerful tools and options to improve the performance of your site. The XML sitemap updates automatically, the coding of the sitemap lets search engines know how often to check back on your site for any updates you may have made. Note: In order to submit your sitemap to Google you will need to have verified your site first. For help verifying your site with Google, take a look at out Google Site Verification Tutorial. Step 1: Head to the Google Webmaster Tools Site by clicking here, and log in. Then click on the website that you want to manage. Step 2: Click on the Sitemaps button, currently there will be no sitemaps attached to your website. Step 3: Click the orange Add/Test Sitemap button. A pop-up should now appear, in the box provided enter sitemap.xml (this is the link to the sitemap that InstantPro automatically generates and updates for you), then click the Submit button. Step 4: You will now need to click the Refresh the Page link. 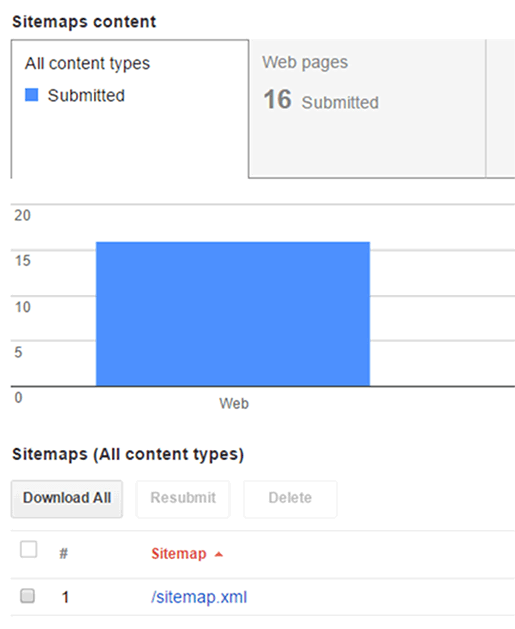 Your XML sitemap is now linked to your Webmaster Tools Account; you can now see any statistics relating to your sitemap in your Google Webmaster Tools Account.